“For me, comfort food is about easy cooking. 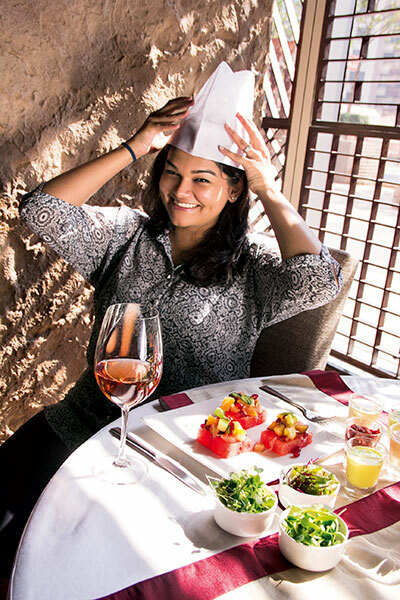 But not just anything, it has to be full of flavour,” says sous chef Dhwani Agarwal from Masala Library by Jiggs Kalra, Mumbai. According to Agarwal, the end of a long working day is when she craves comfort foods the most. When she isn’t in the mood to indulge in something fancy or elaborate, in come dishes such as homemade, rustic pizza or a well-made sandwich combing simple but exotic ingredients. These make up her comfort foods. Agarwal’s regular meals are a good mix of roti, daal and subji and sometimes even a piping hot bowl of khichdi, daal baati churma and Sindhi kadhi is something she likes to wind up her day with. Her favourite company while relishing these is usually her family, since she doesn’t like to eat alone, but once in a while an episode of Breaking Bad or Suits is welcome. “I love cooking the entire meal from scratch and then relishing it by myself,” says the chef who has a strong liking for spicy and impactful flavours. Watermelon, cut into rectangles, 90 gm; Green apple, 7 gm; Pomelo, 5 gm; Plums, 5 gm; Orange segments, 10 gm; A pinch of chaat masala; A few sprigs of mint; Lemon juice, 5 ml; Crushed masala peanuts, 5 gm; Tangy chutney, 10 gm; Diced cucumber to garnish. Apply chutney on the watermelon rectangles. In a bowl, mix all the fruits and add chaat masala, lime juice, mint leaves and peanuts to it. Toss well and place a spoonful on each watermelon rectangle. Garnish with diced cucumber and micro greens, and serve.